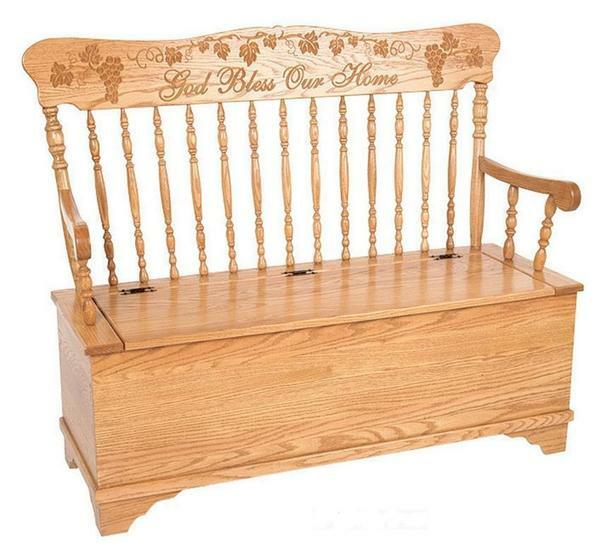 Create a family heirloom with our Amish Pressback Storage Bench! Order in oak or cherry, and select from 36", 48", and 60" lengths. Add arms, scoop seat, and carvings or painting as your home and tastes require. This piece fits perfectly in the foyer or family mudroom. Store mittens and scarves for winter bundling, or keep additional blankets ready in its convenient storage compartment. One of our favorite things about this storage bench is the opportunity to carve or paint the back. Inscribe a welcome to guests, favorite verse, or the family name! With so many options, your home's bench is sure not to resemble another's! Of course, this piece is also handcrafted with 100% solid wood and durability in mind.